I was relieved to have escaped from the close call and began to relax once again. I knew I was safe and had gotten through what could have been a major problem. It was quiet once again out there in the middle of the ice-covered docks. The sea felt still, the night frozen in place under an unmovable nocturnal blanket. Things seemed to have slowed back down to normal and my thoughts began slowly drifting back to her. I was finally alone with the rest of the world held at a safe distance, resuming its slumber after an unwelcome incursion. I looked around and there was nothing. No one else was there. Suddenly, I heard something else coming at me from a distance and reflexively crouched down. Looking around the corner from behind the boats, I saw a snowplow heading towards me, I moved to escape its bright lights but no matter what I did, the truck seemed to be following me. I was frightened so I took cover under one of the taller boats and went underneath one of the tarps, until hidden safely out of sight. I heard the wind pick up, and I wanted to run to get away from its harsh glare, but I stood fast against it. I waited nervously until it completed its rounds and finally slipped out back onto the main road. I stood there until I could no longer see its headlights. I stood there and watched as the large hulking truck vanished over the horizon, its headlights flickering out of view as it receded into the night. The ocean overtook me once again and I stood there alone balancing on the creaky boards. I heard something in the distance that sounded like a horn. I knew my shelter would be temporary, and I decided not to stay there any longer than I needed to. I ran out from the docks and onto the street, looking in every direction. I found myself exposed under the streetlights, my shadow on the ground dangerously doubling my visibility. This was an unwelcome development. The whole point was to stay hidden. Now, anyone would be able to see me. They’d ask questions. What was a kid like me doing out so late. Who was that strange older woman he was with? I wasn’t prepared for any sort of interrogation. I already knew a few things, but not enough. I wasn’t ready. I decided to seek a more secure shelter, I ran over the roads away from the beach, running quickly over the sidewalks and through our paths into the hills. Finally sheltered under the thicket of trees, I caught my breath and I was back to safety. I escaped the lights and their predatory intrusion. My legs were running faster than I thought they could handle, outpacing the currents in the imposing waters nearby. I was carried by my fear of being caught. After a few minutes, I stopped running and began to catch my breath and walk slowly, and found myself protected once again under the thickets of trees. There were no shadows here to alert someone to my presence. It was a little bit safer up there but I still couldn’t decide where to go next, but knew I needed to take a rest from thing. Even though I out ran the truck and escaped detection, I still couldn’t shake the feeling that something had gone wrong. In one moment of recklessness, I had almost messed up our plan. I walked over the hard, icy steps once again, but in the darkness of the winter they felt imposing as if they were purposely blocking my way, Each difficult step reminded me that I was alone once again. Under its nocturnal cover, our secrets were protected from the world. I knew I couldn’t let anyone find out, their inquiries would ruin everything for me. I had made so much progress over the past few months, slowly deciphering the puzzles she laid for me. None of the solutions were obvious, but I knew I had to continue unlocking them. She inspired me in ways I couldn’t explain. Whenever things seemed to get difficult, I could always remember how it felt to hold her hand when we were together in those fleeting moments. This gave me an unspoken resolve that seemed more like destiny than accident as the dreams and memories built on each other. I wouldn’t let anything or anyone stand in our way. Even though our visits were fleeting, each one seemed to have a larger meaning. Most of the time, It would take me weeks or moths to figure out what something meant, and I’d walk up to the hill. I could be alone there, concentrate away from the distractions and false paths I could have easily taken. Consequently, this was a place in the world that needed protection from any intrusion. I knew if anyone else found out, it would unsettle the balance I had achieved. This would be a frustrating task to complete; with each step I was learning something new but I had to keep it to myself. I knew I was going in a different path and I accepted it wouldn’t be normal. As the weeks went by, I discovered ways see things in a different way. I tried to pretend I was a normal kid, but things inside my head were constantly swirling. I had to keep it hidden, even though no one else knew what was happening. It had been a long winter and it didn’t want to let go of its grip. The ice under my feet seemed like it would never melt. Our night skating together seemed like a lifetime ago, but remained vivid, as if it had happened hours ago. I felt trapped between diverging worlds that night and couldn’t bridge their contradictory messages. I missed the summer and all that happened then, but the winter and its icy false-calm and cold security over-ran the world. I felt trapped and couldn’t run out to escape. Once again, the outside world felt threatening, each storm adding another layer of isolation on top of each other. I couldn’t escape the feeling that the world was closing in around me, relentlessly conspiring with the wind to freeze our dreams permanently. I slowed down and took a look up to the sky, covered in thick clouds that blocked the moon and stars, hastening the night into ever deeper slumber. I was wide awake and it was getting late. As the night unfolded, I knew I’d have to go back home. The streetlights kept me company as I walked through the empty streets. There seemed to be something guiding me home and I felt a kind of presence as I slipped through the back door and returned. I was relieved that I had made it back undetected, but I knew I’d have to be more careful in the future. It was a close call and there seemed to be more at stake. I was beginning to figure out a few things and didn’t want to lose everything I’d worked for with one reckless move. I moved carefully around during the daylight, carefully measuring my shadow and making sure that nobody was following me around. I decided that I wouldn’t go up there as often, at least for awhile. It was cold anyway, and I knew she wouldn’t be back there soon. It didn’t mean that I didn’t think of her nearly every day, because I did. As I worked through each day, I took small moments out of my usual routine and tried to figure some of those things out. Usually, I’d write a few small notes in the back of my notebook, cryptic as they were, it helped me figure out some things. At least I was smart enough to keep this part of our code to myself. Once a week, I’d take the pages from the back of my notebook and tear them up so no one would be able to see what was happening. In order to keep things at a safe distance, I tried to keep my mind busy with other things in order to keep others’ suspicions low. Fortunately, I never allowed myself to lose sight of what I needed to figure out, but it was a welcome distraction from what had been an overwhelming period of time. While this was happening, things around me began to change slowly but surely. I began to see things I hadn’t seen before and I noticed that my perceptions were beginning to change. I knew that I was going to be apart from the other kids in class no matter what I did, but I played along. Most of them had no idea what was happening, I still kept things quiet. It was something that I was beginning to become accustomed to by that point. The cold winter seemed like it would never end, tightening its grip with each day and I could sense the ground’s stillness as I walked towards school each morning. As the storms continued, they deposited layers of ice and snow, until they created icy mounds that seemed to get higher with each week. I have to navigate around them, and they seemed to take pride in forming new barriers that blocked my way. I was beginning to get a little claustrophobic but I did was able to take some consolation in my new Atari system. It was big and black, mean and professional. Mostly, it played an awesome version of Defender that was very close to the arcade game I had become obsessed by the previous summer. Each time I’d plug it in, it would also have the effect of transporting me back to that time and the day we first met. As the long nights dragged on, some things began to happen that I didn’t understand. I began to have prophetic dreams where I’d see strangers, people I didn’t know. They seemed older than me and I had visions of friends I hadn’t met yet. Sometimes, I’d see myself walking through long hallways not knowing where to go next, but hearing their voices, helping me along and feeling strangely familiar with them. Despite how out of place I felt, I knew that there was a future out there waiting for me. I didn’t feel like I knew enough to really understand but it was reassuring to me that I’d have something beyond that time. I saw things that made me happy, but there were also some things that were going to be difficult. I knew I’d get past those barriers standing in the way of my journey, but it did make me pause for a moment, knowing that every step wouldn’t be easy. I knew on some level, she was trying to send me messages, though I couldn’t figure out their exact meaning. This let me plan ahead in some circumstances, allowing me to anticipate things that would happen. Other times, they just left me confused and it would take me years in some cases to fully understand them. As those weeks unfolded, the visions became increasingly vivid. Some of them were benevolent. In one of them, I was walking through the old playground and I had a sudden realization about something. I awoke and already knew what my fanzine would be called almost exactly a decade before it began. I saw a few other things before they happened such as walking through hallways and hearing a familiar voice call my name, though I wasn’t quite sure who it was or what my destination would be. I remember walking through a gate and into what seemed like another dimension. I knew I was seeing some things that hadn’t happened and this strange clairvoyance could be disorienting and confusing at times. I had good luck since there always seemed to be someone at my side to help me along, silently watching my progress. I slowly began to realize that none of this was normal, at least for most people. I reinforced my efforts to keep things hidden. After awhile, I was afraid to write anything down, not even in secret code in my hidden notebook. Whatever was happening would have to stay hidden from the world, no matter what. At one point, the night visions unfolding within my head were saturated with her presence. She looked different than the times I’d seen her to that point. Somehow, she could seem completely in my dreams. In some instances, she looked exactly the same as she always had. In others, her dark hair was streaked white and grey by years that had passed seemingly instantaneously. I could always recognize her immediately regardless of how old she seemed. Her unpredictable appearances would presage with dense foreshadowing but she almost always seemed to be smiling. She remained a contradiction to me and I couldn’t reconcile these contradictions. 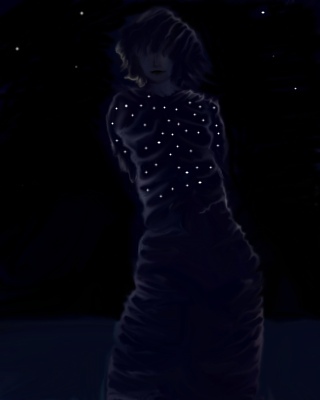 In some of those dreams, there was a strange glow around her. Instead of blending into the night, she seemed to be defying its pull. I’d often see her standing alone staring up against the moonlight. I wasn’t sure how or why she seemed to have changed so much, but the important thing was that I still recognized her immediately, despite these transformations she underwent, her eyes were unchanged Her diffuse signals weren’t always easy for me to pick up but I could usually decipher enough to figure them out. As the winter’s seemingly endless cold relentlessly battered the nights, my dreams about her only intensified. They began to take over my mind and they gradually seeped into the daylight hours. Occasionally, I’d hear someone whisper my name and I’d find myself looking over my shoulder looking for her. In some subtle way, she was telling me to keep going when I needed encouragement. I looked to her to help me find my way but I would often find myself becoming lost regardless of what I tried to do. I was starting to walk a little on my own path but, despite my progress, I still had a lot to learn.